For some outdoor chefs, cooking chicken turns the grill into a hot seat and a relaxed outdoor meal into a fire drill with refreshments. Getting chicken done means getting it dry, at best, or burned, at worst. To make appealing, juicy grilled chicken, start with bone-in halves and apply strategies accumulated by generations of outdoor chefs. Combine Southern-style or tandoori-style marinating with a Tuscan grilling technique for juicy grilled chicken. 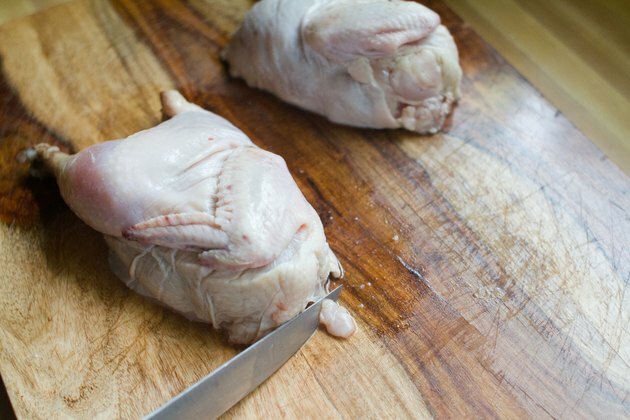 Lay chicken halves on the cutting board. Cut away and discard lumps of fat or excess skin, but do not remove the skin. Flatten each chicken half by pulling or tapping to break the large wing joint, tucking the end of the wing under the edge of the breast. Press down hard to flatten the curve of the rib bones under the breast. These techniques imitate the butterflying, or spatchcocking, method that lets you flatten a whole chicken to cook it on the grill. Mix the marinating liquid with spices and cover the chicken. If you are marinating more than four chicken halves, double the marinade proportions. Refrigerate for 2 to 3 hours. 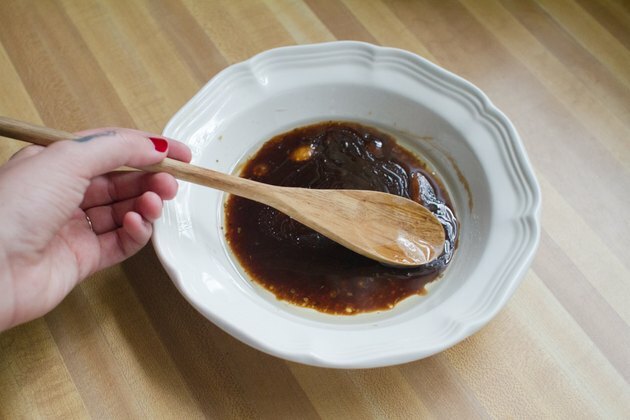 A dairy-based marinade both tenderizes and moistens chicken. Cover all the chicken parts with marinade if you are using a bowl. 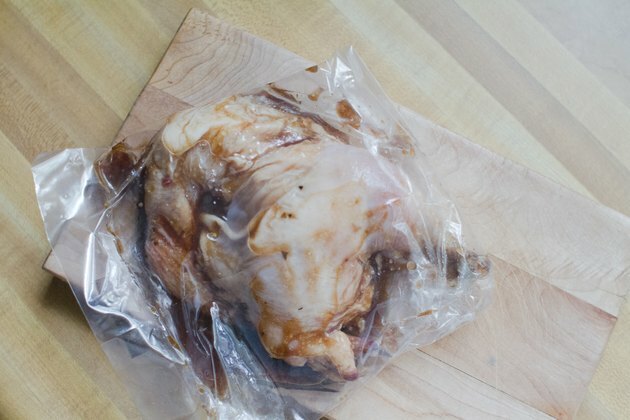 Alternatively, a quick way to use a small amount of marinade effectively is to seal the chicken and liquid in a plastic bag. Remove the marinated chicken from the marinade and set it on a plate for 30 minutes before cooking to bring it closer to room temperature. 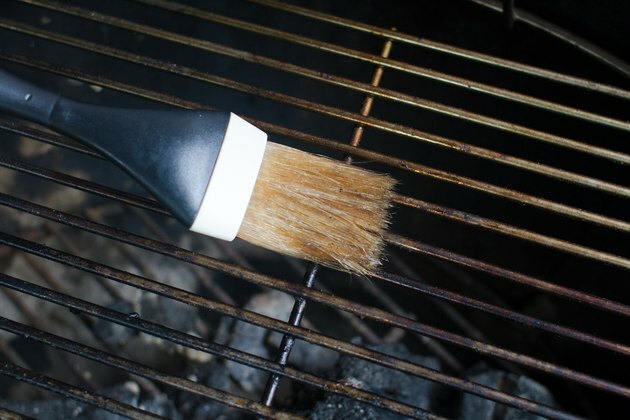 Brush the top side of your grill rack with a thin layer of oil, the type with a high smoke point, like sunflower, safflower or canola oil, to maintain as non-sticky a grill surface as possible. Set gas grill burners for medium-high and indirect heat by turning off one or two of multiple burners. If you are cooking with charcoal, build a hot fire that you can push to the edges of the grill bed to provide indirect cooking heat. Your goal is a cooking temperature of 350 to 400 degrees Fahrenheit. 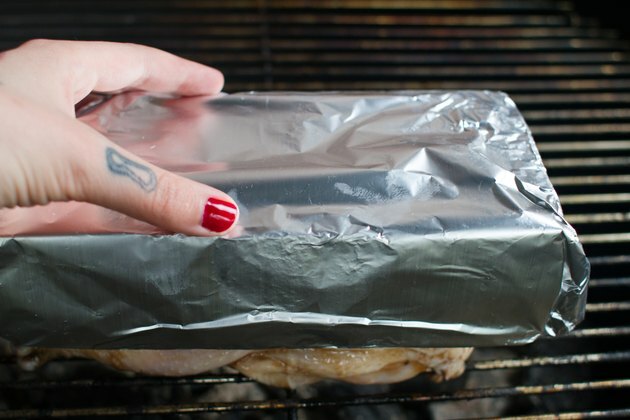 Wrap each paving brick completely in aluminum foil and set the bricks on the edge of the grill rack to warm. 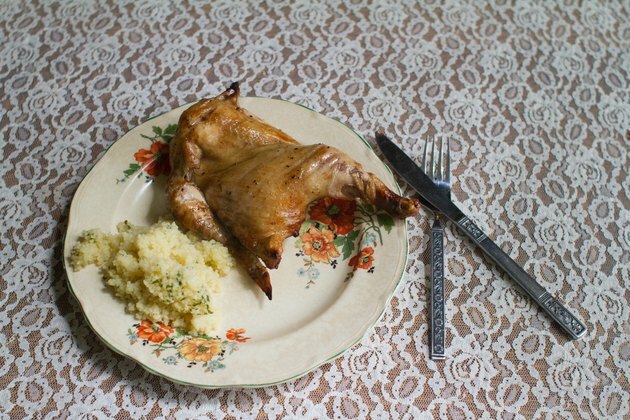 Chicken cooked under the weight of a brick is a Tuscan dish known as "pollo al mattone." Arrange the chicken pieces on the grill, skin-side down, so that they do not touch each other and do not sit directly over the fire. Place the bricks over the chicken pieces, pressing them closer to the grill. Let the pieces cook for 10 to 12 minutes, or until the cooked surface is sufficiently solid that you can turn the chicken pieces over without tearing the skin. If you are using a gas grill, cover the chicken while it cooks. 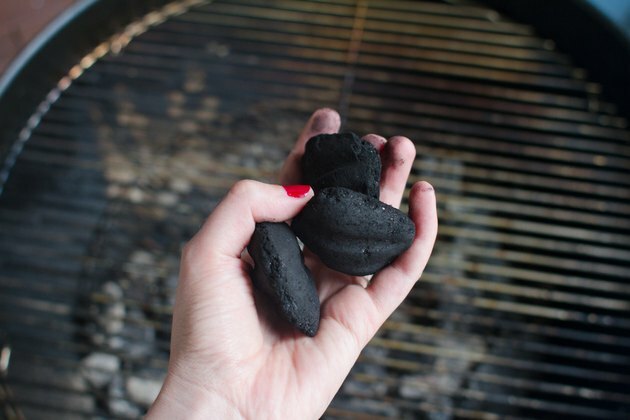 Cover your charcoal grill, but check it every 5 minutes, since the fire may not be burning as evenly as gas. Turn the chicken pieces over and replace the bricks. 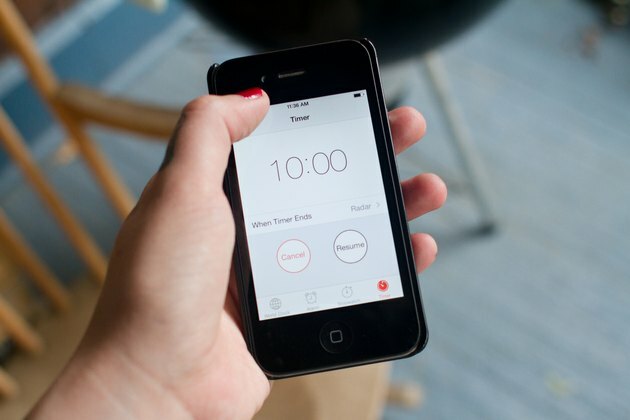 Continue to cook another 8 to 10 minutes, or until an instant-read meat thermometer inserted in the thickest part of the thigh or breast reads 165 degrees Fahrenheit. Avoid marinade recipes high in oil or sugar. Oil can cause flare-ups that burn chicken skin, and high levels of sugar caramelization can also cause chicken to burn. High-acid marinades, like undiluted vinegar or citrus juice, can actually make chicken tougher and more prone to drying out. You can weigh chicken down with a foil-covered heavy skillet in place of bricks. 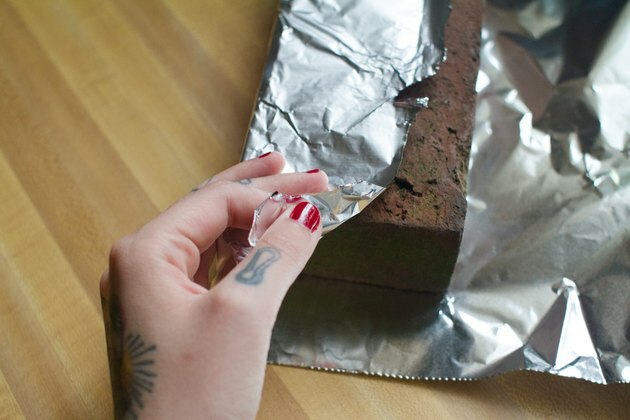 When making pollo al mattone, treat hot bricks carefully. Use heavy gloves to move them, and let them cool gradually on the grill when cooking is completed. 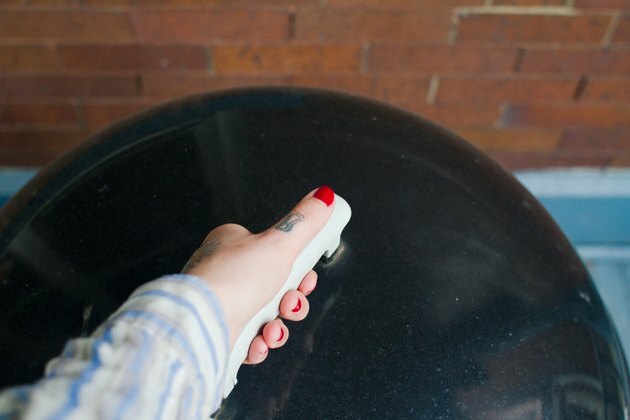 If you usually spray or spritz water on minor flare-ups, move bricks completely out of the way before doing so. Sudden temperature changes, like a spritz of water, on part of the brick surface can cause abrupt or explosive cracking. As with all grilling, make sure your grill is at least several feet from your serving or eating table to protect diners from contact with hot surfaces.